I suspect that many ships would have no problem getting through already. No problem if following 50 Let Pobedy! An unaccompanied yacht might prefer to wait a little longer however? Not so much thinking of yachts as commercial shipping with a high ice class. 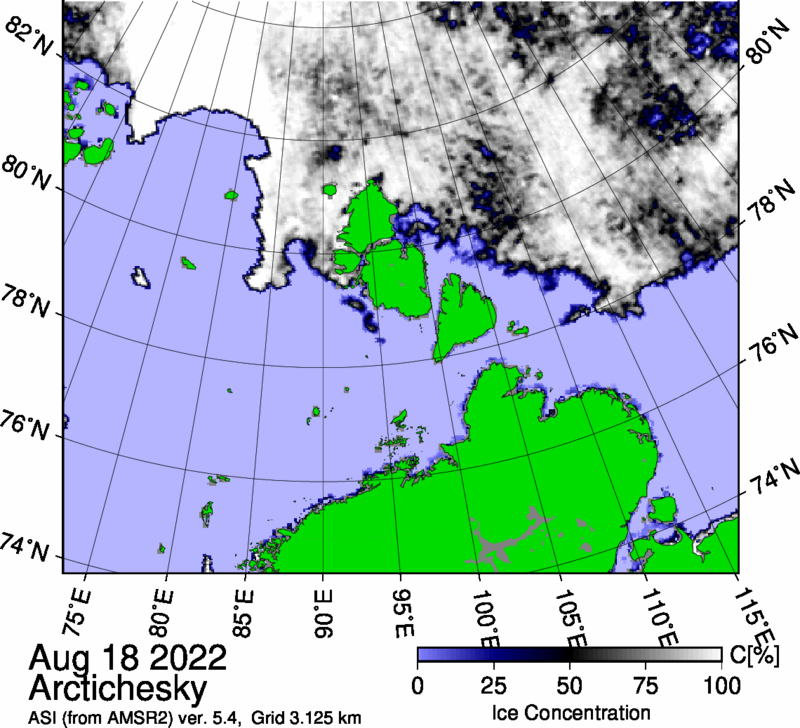 If you look on Modis there seems to be a route through Vilkitsky Strait, but perhaps too much ice around for anyone to risk it yet. The ice is going pretty quickly, anyway. I don't think the Russkies will worry about a few scratches on the ships in their convoys. (Many years ago I met some Russian trawlermen in West Africa, having a break from Arctic Fishing to raid African waters. They were great company but totally nuts). And Russia does have 40 icebreakers to assist. But isn't there a database somewhere that tracks all registered shipping? Plenty of ships in the general area, but none that are obviously on their way through from Europe to Asia or vice-versa yet. But isn't there a database somewhere that tracks all registered shipping? That would mean travelling through Vitilsky, if accurate. The Mikhail Kutuzov is also showing on the live map as heading towards Taicang in China, which would also probably mean taking the Northern Sea Route. However the live map isn't confirmed by the page for the vessel, which still has it in Arkhangelsk. We shall see. Meanwhile Yamal reports that it's "Waiting the approach of ships"
What makes Yaraslov so wise? Nestor the Chronicler and later Russian historians often presented him as a model of virtue, styling him "the Wise". But since Yamal is an icebreaker, does this really count as the northern sea route being open? To me it seems we still have a few days to wait before it can be described as open in the colloquial sense. And then, do we need to consider whether it actually broke (or pushed aside) any ice, versus just being along for extra insurance? But since Yamal is an icebreaker, does this really count as the northern sea route being open? After loading its cargo at the Snøhvit LNG export terminal in Norway, in which Total has an 18.4% interest, the Christophe de Margerie is taking the Northern Sea Route to Boryeong in South Korea, where it will deliver a cargo for Total Gas & Power. It’s the first unescorted merchant LNG vessel ever to take this route, which makes it possible to reach Asia via the Bering Strait in 15 days versus 30 days via the Suez Canal. Unescorted tankers from July to November? Watch out for GACs ? One day some company or other will go "a bridge too far"? Hubris is the normal human condition. One day some company or other will go "a bridge too far"? Avoiding the use of heavy fuel oil is mandatory in the Antarctic, but merely "encouraged" in the Arctic. Yes, but an LNG tanker crash would have a less long lasting environmental impact than oil. Does the Christophe de Margerie burn LNG, as most or all of the more conventional tankers do? They, even if accompanied by one of the modern mammoth Russian nuclear icebreakers, shouldn't leave too much of a mess behind. It was a shame when Total's CEO was killed in that horrible accident. He was the only head of a major energy company that seemed to have a real understanding of global warming and what could be done to ameliorate it. The icebreaking LNG carrier will be powered by a diesel-electric propulsion system consisting of four 12-cylinder and two nine-cylinder Wärtsilä 50DF diesel fuel engines, as well as an electric propulsion system. The four-stroke Wärtsilä 50DF engines, which run on LNG and light or heavy fuel oils, deliver a total power output of 64.35MW. I know not what fuel is used in practice. Could one be forgiven for imagining that the Christophe de Margerie is running astern in that photo? Else the ice is healing up very quickly behind her, and opening obligingly ahead! One of a fleet of specially designed ships for operations in the high arctic. In terms of the Northern Sea route being open to these ships according to Yamal operations from Sabetta will be year round with the East route being utilized from July to December, The full fleet of 15 will be in operation by the end of 2020, which is a lot of LNG. Is LNG the most "environmentally friendly" of the three fuels it can use? Bunker fuel is actually bloody awful stuff. It has no sulfur spec globally, and is responsible for a significant percentage of criteria emissions. The link says it uses diesel. I is confused. Are these 15 ships carrying LNG or using LNG as fuel or both. As I understand it the engines are usually run with between 15 and 85% gas. Still looks closed, although it can't be long now. My normal method is to trace a clear path on MODIS but I can't see cloud atm so I've made do with 1km MASIE. Hey Quantum - Was it you my alter ego "Snow White" recently bumped into on Twitter? Elucidating "her" cryptic message. Gotta link to your source? "She" knows where it came from, but probably most of your readers do not. An interesting article. If Poland is insisting that American LNG be competitive with Russian gas out of the pipe, as well as Qatar's LNG, their's little or no room for profit. Shipping fraked LNG half way round the world can't work in a free market. Geographical reality remains a factor. Shipping Russian and Norwegian LNG to SE Asia in 15 days will cut into hopes of Canadian and American LNG sales in that direction. I suppose we'll have to add Norway to the list of European Nations being negatively effected by the so called Russian sanctions. Who will be left supplying fuel to Ukraine after Russia pulls out in 2019? They have a poor credit history. Northern Fleet ships are sailing for the Arctic under a combat training plan, Captain First Class Vadim Serga, chief of the Northern Fleet press service, told RIA Novosti. "Today, a unit consisting of several Northern Fleet warships and support vessels sailed from Severomorsk to the Barents Sea under a combat training plan and set course for the eastern Arctic," Serga said. The unit includes the anti-submarine ship Severomorsk, the landing ships Kondopoga, Alexander Otrakovsky and Georgy Pobedonosets (St. George the Victorious), the rescue tug Pamir and a mooring vessel. Who? The USofA conspired to crash the Ukraine, then have recently convinced the nut cases in Kiev to blockade coal from the eastern coal fields as if it was a way to harm the opposition there. So then, who will the Ukraine get its energy from? Why! From the USofA of course, at great expense. Ukraine has no money so USofA will lend them the money so increasing the indebtedness of said sorry country and its thrall to USofA. And the Fascist Yankee puppets in Ukraine will be party to the contracts and will rake a big slice off the top before the poor babushkas get the chance to fill their coal scuttles at prices they cannot afford. All very circular and obvious. In the mean time of course Ukraine's ability to earn any foreign income has tanked. Its a basket case and only good as a cheap training ground for useless yankee tank crews. etc etc. Adam, this is off-topic and more suited to the Russiagate thread, or some such. My bad Neven. I read the Hefaistos link and got carried away. I think the opening of the Northern Route is one of the very few good things that is emerging from melting Arctic Seas. The NW Passage is fraught with difficulties from the US's insistence that it is an international waterway, to the Canadian Government's lack of built up infrastructure. The Law of the Sea says it's Canadian, the Americans refuse to sign the treaty. Russia ain't the enemy here, they signed early on. Russian nuclear icebreakers are as close to non-polluting as we're liable to get, and her investment in repair, rescue, and restocking harbors should favor this route until the polar route is open to everyone. It's sad that she feels the need to protect it militarily, but the times are as they are. Shipments are moving between Europe and the Orient, and until the High Speed Rail lines are complete this shortcut through the Arctic saves many tons of CO2 - and some money. So it seems that routes to Asia for USA coal are likely to come from the East Coast USA. From the coal docks at Baltimore to Tokyo Bay its..
18,400 km via Panama Canal - plus canal fees and delays and ship size limitations. So the ESR is only a trivially-longer trip from the East Coast USA to a destination in Asia than via Panama, and it avoids the size and cost limitations of the Panama Canal. 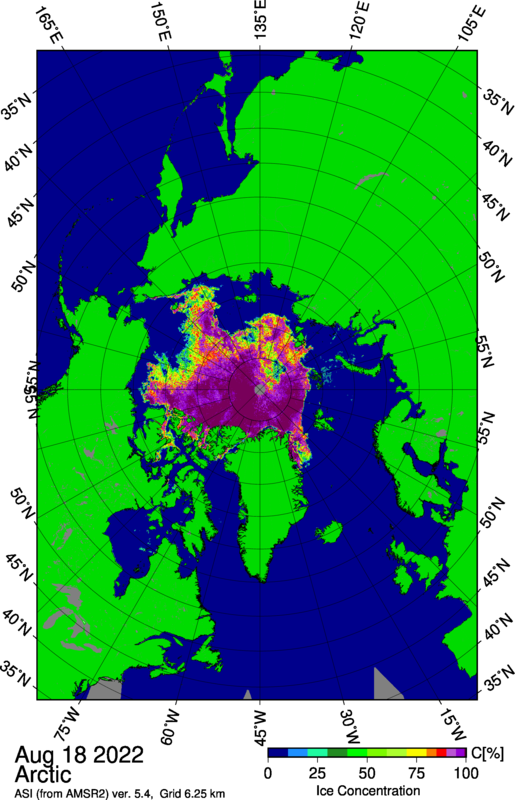 Would definitely make sense to go via the Arctic, with a clear time/distance preference for the North West Passage if there were ice-free water and the local infrastructure for a safe voyage. Transporting coal via the Northern Sea Route is like adding insult to injury. Territorial waters or a territorial sea, as defined by the 1982 United Nations Convention on the Law of the Sea, is a belt of coastal waters extending at most 12 nautical miles (22.2 km; 13.8 mi) from the baseline (usually the mean low-water mark) of a coastal state. Anything outside this 12 miles range is 'international waters' where "no State may validly purport to subject any part of them to its sovereignty". This is something neither Canada (who claims the entire NWP is theirs but doesn't act if you cross it) nor Russia (charges a fee and shoots at you if you want to cross the Northern Sea Route without their permission, even if you are more than 12 miles from the coast) disputes. See the contradictions with the Law of the Sea from both Canada and Russia in this ? And how they differ ? Territory generally now includes water over continental shelves. Most countries recognize this but notably the US does not because they insist they can send their warships to within 12 miles of any country. Oh yes indeed Rob! Mankind will not go out with just a whimper! We will leave a dreadful mess behind as our final convulsions destroy the diminishing supply of goodness with our increasing demands of badness. The Laws of the Sea are very clear. There are no claims of 'territory' or 'sovereignty' beyond 12 miles. It kind of makes sense too : In the olden days, pirates or rogue states claimed a certain part of the sea their own, and demanded one paid a fee to pass. Luckily we have the UN now, and the Laws of the Sea, signed by all major states including the US. It is called the 200 mile exclusive economic area, and is about exploitation of the oceans. However, that does not normally apply to freedom of movement of ships outside the 12 mile limit, which is the limit of jurisdiction over shipping - power to arrest, for example. Beyond 12 miles, it is the Law of the Sea. Russia is therefore using the old fashioned law "Power Gives The Right" to bully submission. And who can stop them ? No-one.